An experiment was set up by putting 5 monkeys into a room. In the centre of the room, directly below a trapdoor in the roof, a ladder was placed. The scientists then lowered a banana from the trapdoor in the roof.Immediately one of the monkeys spotted the banana and headed up the ladder. As soon as this happened, the scientists sprayed all the monkeys with cold water. Needless to say, the monkeys were less than impressed. A few hours later, a banana was again lowered through the trapdoor, and once again one of the monkeys headed up the ladder to grab it. Once again, all the monkeys were given a dose of ice cold water. This only needed to be repeated a few more times, because it didn’t take long before some of the monkeys realised how this worked - as soon as a monkey headed up the ladder, they would all get sprayed with cold water. So the next time a banana was lowered and one of the monkeys started up the ladder, the other monkeys would pull the culprit down and give them a beating. Eventually all of the monkeys knew not to go up the ladder, regardless of how tempting the banana looked. 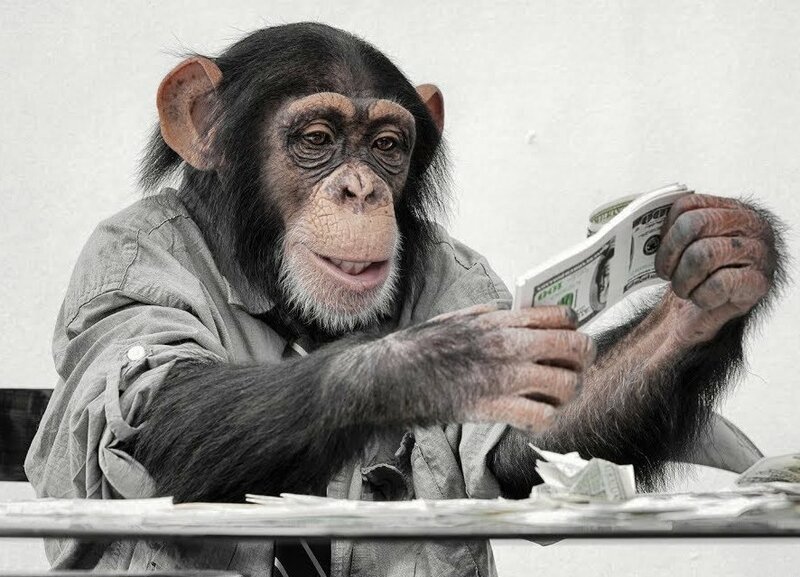 Next, the scientists decided to mix things up a bit by replacing one of the monkeys in the room with a new monkey. Obviously this new monkey had never experienced the cold water phenomenon, and so, as soon as the banana was lowered, he headed straight for the ladder. The other monkeys saw the new monkey heading for the ladder, and they immediately stopped him before the he could get there, and beat him up. It didn’t take long for the new monkey to learn that the ladder was not be climbed, even though he had no idea why. Next, another of the original monkeys was replaced. Like his predecessor before him, when the new monkey saw the banana being lowered, he immediately headed for the ladder. The new monkey was of course stopped and beaten up. But something really interesting happened - the first replacement monkey also joined in on the beating! Even though the first replacement monkey had no idea why he was beating up the new monkey, he did it anyway because, clearly, that’s just how things are done around here! And so this new monkey quickly learnt that the ladder was not to be climbed. The monkeys just accepted the fact that if you tried climbing the ladder you got beaten up – even though there was no apparent reason for it. They knew that was just the way it worked. Worse still, the monkeys also knew that if you see someone else trying to climb the ladder you give them a solid beating. Because that’s just the way things are done around here! It’s an interesting story, and there are a good few lessons in it. I think the reason it has stuck with me after all these years (unlike a lot of the actual content from the training course) is because I see people acting like the monkeys in the experiment quite often, and it keeps reminding me of this story. But perhaps the most prevalent mindset of “that’s just the way things are done around here” is in the way people approach their working careers and retirement saving. Society tells you that you start your working career, and you do your 40 hours per week for somewhere around 40 years, and then you get to call it day. Everyone just seems to accept this. As we run on our hamster wheel, we are told to save 10-15% of our income, so that when we stop running at around age 60/65, we should have enough money to see us through our golden years. “Because that’s just the way things are done around here”. There is so much around us telling us that retiring at 55 or older is the only way. I see it all over. I see it in RA products which lock your money away until you are 55, I see it in legislation which charges higher tax for accessing money before age 551, and I even see it with some of the online retirement calculators! Financial Freedom at a young age? Does not compute! And so many people continue down the same path which thousands have walked before them, without even blinking an eye. We do not seem to realise that there are only a very limited number of hours in a day, in a week, in a year, and in a lifetime. Shouldn’t we be spending as many of those hours on only the activities which we find the most interesting, fulfilling and meaningful? Granted, there are some people who wake up every weekday morning, and for the next 40 years (and probably beyond) would choose nothing else other than to go and do their current job. But these are a very select few. For everyone else, I can’t help but wonder why we are happy to accept a job we don’t necessarily enjoy doing which, for decades of our life, will constrain us in the amount of time and energy we have for other far more meaningful pursuits. Things like family, travel, and learning take a back seat while we grind it out decade after decade to cover our (mostly unnecessary) expenses in the hope that when we retire from our work careers, we will have something that can see us through to our retirement from life. Why is it that everyone accepts this? Is it because “that’s just the way things are done around here”? I have always been of the opinion that when the answer is “because that’s just the way things are done around here” I should dig a little deeper. I often find myself questioning norms and conventions, because I have quickly realised that “normal” is often not very efficient and far from optimal. And I think this is especially true of how society views work and retirement. We need to remember that there are always options! Sure, 9 to 5 for 40 years is an option, but it is very definitely not your only option. No one is forcing you to retire only after you have turned 55 – that choice is very much in your hands. If you love your job and don’t mind doing it until you are old and grey, that is fine – just make sure that you are doing it because you made a conscious decision to, and not because it is what everyone else is doing. If becoming financially free at a young age to pursue only the things that give you the most happiness and fulfilment is important to you, then know that you have the power to make it happen. It is possible to create a life of working only on the stuff you want to, when you want to, where you want to and how you want to. You just need to prioritise it above other less meaningful pursuits. Make sure your finances reflect your goals and dreams, and your spending and savings habits are a representation of what is important to you. You have the power to be better than “that’s just the way things are done around here”. Don’t let society, norms and conventions throw cold water on you as you reach for that banana! When you read about the story of the monkey experiment at the start of this article, did you believe it was something that actually happened? I certainly believed the story the first time I heard it. But then, while doing the research for this blog post, I found out that no such experiment was ever conducted. Despite numerous people accepting it as fact, the “experiment” is totally made up. So while the story makes for some excellent lessons, it is exactly that – only a story! And that just proves my point – always, always question! Finally, let me leave you with this excellent quote by Ellen Goodman. Let’s all try be a little better than “normal”! 1 Sure, I can understand that Government are trying to deter people from accessing their pension money when switching jobs, but it also means that anyone who legitimately wants to retire before age 55 is inadvertently penalised.